Book Review The American Monument: Second Edition By Lee Friedlander Reviewed by Blake Andrews The American Monument is a timepiece, each photo freezing a slice of the past, and taken as a whole the book is a portrait of America at a certain point in time. Browsing the photos one is impressed with the mundane statuesque quality of old American memorials. Photographs by Lee Friedlander. Eakins Press Foundation, 2017. The American Monument: Second Edition. Photographs by Lee Friedlander. Essays by Leslie George Katz and Peter Galassi. Eakins Press Foundation, New York, USA, 2017. 91 pp., 213 duotone illustrations, 17x12". It takes a certain amount of chutzpah for a young photographer to publish an eight-pound book called Monument. That's basically what Lee Friedlander did in 1976 with the first edition of The American Monument. If the title didn't get the message across, the mammoth size did. This was not a mere collection of monuments, but a Monument — capital M. Friedlander was a cheeky forty-two-year-old at the time and was beginning to loosen the reins of his tightly packed documentary style to incorporate vegetation, open space, and reverie. As Szarkowski described it, the shift was "away from irony, from the glittering visual joke, and toward a more direct (and complex) description of subjects that he found important and beautiful." Eventually, his subject matter would be expanded to include, well, everything. But in 1976, for his second photobook, Friedlander focused on the monumental. 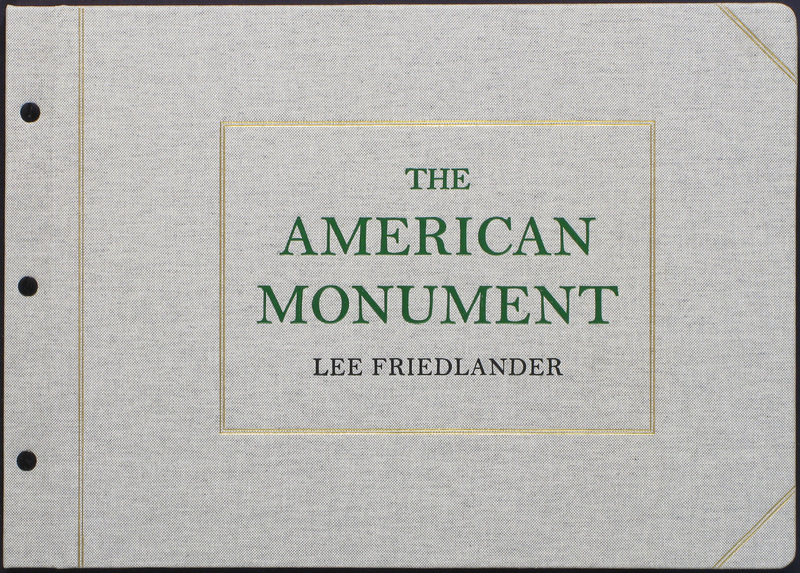 The American Monument: Second Edition Photographs by Lee Friedlander. Eakins Press Foundation, 2017. As luck would have it, his social circle at the time intersected with Richard Benson, just coming into his own as one of the world's premier photographic printers, and Leslie Katz, a high-end publisher. Together they formed a sort of Holy Trinity of photobook production. Eakins Press took its stylistic cues from the archaic world of its namesake, and The American Monument felt like something one might find in an antique shop. It had a thick cloth binding, with regal type and gold flourishes garnishing the cover. The tome was roughly 12 inches by 17, its wide pages (91 of them, with 213 photos) mounted on detachable screw posts so to allow removal for display. They'd look beautiful framed on a wall — the duotone separations prepared by Benson were immaculate — but it's doubtful many owners took advantage. The book was fine as is and too precious to tinker with. An unadulterated first-edition copy currently fetches roughly $2,000 on eBay. For book lovers with less disposable income, there's good news. Eakins Press has just released a second edition of The American Monument. The new edition has a beige cloth cover design, a new afterword by Peter Galassi, and a brighter paper stock. But essentially this is the original 1976 edition — complete with the screw-post binding — now available to the masses. As grand as the book is, its subject matter is not treated with the same reverence. After all, this is Friedlander. Civic boosters looking to spotlight the grandeur of local monuments, listen up. Lee Friedlander is not the photographer you should hire. The American Monument shows scant spirit of pride or boosterism. As with most of his oeuvre, it's tough to read his personal feelings one way or another. Some of the photographs, for example, Fireman's Memorial in New Jersey or Buffalo Bill Monument in Wyoming, seem openly celebratory. In others — perhaps the majority of photos in the book — the monuments are disregarded as so much visual filler. The well-known photograph of Mechanics Monument in San Francisco, for example, tosses the eponymous statue to the side of the photo near an old truck and includes a distant liquor store. Other frames leave the reader scrambling to find any semblance of a monument buried in the visual detritus. There's a certain Where's Waldo? quality, which is rewarded each time after sufficient searching. There's no consistent formula, and that's the charm of Friedlander. It's the vital force that has allowed him to shoot such a variety of subjects over decades. Through it all, he's remained astoundingly receptive to possibility. Each visual scene is approached anew. If this comes across in a book of monuments as moral ambivalence or even anti-patriotism, I suspect he is not particularly bothered. "It's a generous medium, photography," he once famously said. Statues are merely one visual element in the American vista loaded with other information. Some views are more visually generous than others. Some are less so. But it's not his job to worry about which is which. His job is merely to document everything in his own inimitable way: "A bit of Aunt Mary’s laundry and Beau Jack, the dog, peeing on a fence, and a row of potted tuberous begonias on the porch and seventy-eight trees and a million pebbles in the driveway…" Add monuments to the list. Beyond receptiveness, Friedlander's other notable trait is his prolificacy. The American Monument was made during his 35-mm Leica years, a format which allowed him "to peck at the world" in great volume. He shot and printed thousands of photos for the project. They came from all parts of the U.S., though primarily east of the Mississippi where monuments and nationalism run thickest. In the end, only 213 photographs made it into the book. This may be a curtailed figure, yet it's still enormous by any photobook standard. Some photos get their own spread. Most are forced into shared space with others. The book comes in waves, with 2, 3, 4, 5, 6, and sometimes 9 (!) photos at once on a page. If it's an onslaught, it's an accurate translation of Friedlander's manic pace. In the time it took you to read this paragraph he just made four new photos somewhere. As with any photographs made decades ago, these images have an inherent historical quality. Many of the scenes depicted are now altered, removed, developed, or otherwise changed. So The American Monument is a timepiece, each photo freezing a slice of the past, and taken as a whole the book is a portrait of America at a certain point in time. Browsing the photos one is impressed with the mundane statuesque quality of old American memorials. Heroic figures abound with arms, guns, and flags pointed skyward. They seem dated, antediluvian even, made before the flood unleashed by Maya Lin's Vietnam Vetrans Memorial. As Peter Galassi points out in the afterword, the timestamp applies also to the format: "The book is an artifact of the analog age." Shot on film and printed in a darkroom, the project is a throwback.